Holiday season is upon us and while we're thrilled to spend time with loved ones, take an extra serving of pie (life is about balance! ), and Glo bright in this festive season, the holidays can no doubt be challenging when it comes to managing our stress and maintaining the healthy habits we work hard on year round! This month, we've asked SoulCycle instructor/legend, Ryan Lewis, to join our Sip Squad and give us his pro-tips on how he stays rooted during the holiday hustle. Check our our interview with him below! Sip-N-Glo: Tell us a little about yourself and your health & wellness journey. Ryan Lewis: I am originally from the suburbs of Philadelphia, but spent several years going to school and living in New York City and one year in Chicago before making my way back home. Fitness has always been a priority of mine, and indoor cycling has been the one workout that has persisted since I took my first cycling class almost 14 years ago. Health and wellness became a top priority of mine when I decided to make some life changes and started to live clean. Since then, I have left a corporate desk job for the opportunity to pursue a career of a lifetime teaching at SoulCycle. Since making this career switch, I have not taken my position for granted and have always led head and heart first to inspire others to live in a way that takes care of themselves in order to develop the capacity to take care of others. SNG: Holidays are around the corner which is exciting BUT can also bring on the stress. What are some of your pro-tips for stress management and staying grounded during the holiday season? RL: I am very fortunate in that a big responsibility within my role is to create a therapeutic space for the riders in my classes. It is witnessing their reception of this creation that I stay out of the darker themes that can be brought about during the holiday season. Admittedly, my holidays growing up were always a time for light and love; however, there’s that overwhelming list of to-do’s that can cloud the simple joy of the season. I teach every class especially during the holiday season with intention. That intention is typically within the realm of keeping it simple. Too often we succumb to the pressure of showing up in the most perfect way for our loved ones this time of year (finding the perfect gift, etc.). Presently, however, I think we need to reevaluate the value of our time and simplify our gift giving to spending time with one another. We allow ourselves to get busier and busier as days go by, so this year I am trying to keep it simple and focused on quality time. SNG: We’re all about balance (i.e pass the pie, please). How do you maintain healthy habits while the holiday hustle is going on? RL: My fitness regimen is rather intense as I teach seventeen classes a week at SoulCycle and cross-train about 7 times a week at either CrossFit Rittenhouse or [solidcore]. Therefore, I am lucky enough to be a little shameless in how I enjoy the holidays. Though the holidays are a super busy time with events and such, I maintain my personal fitness as a priority when making plans. Whether that means I show up to a holiday party an hour or so late, then so be it. We have to take care of ourselves in this way because no one is going to do it for us. Additionally, I thoroughly believe in the idea of vibe attracts your tribe, so maybe part of your holiday plans with those you are closest with involve some sort of physical activity. Hop into a SoulCycle class (bonus points if it is a holiday music theme ride!) and make time for each other following the class. Everyone will be in good spirits through the power of sweat, manifesting more holiday cheer! SNG: On a day-to-day basis, what are your healthy habits that you find most useful? RL: I am all about consistency. The mornings are the most pivotal time for me as I teach at 6:00AM Tuesday through Friday and early morning classes on Saturday and Sunday, too. Getting my day started calmly is always top priority. This typically means getting up at 4:00AM or 4:30AM to have some espresso and breakfast before heading out to the studio, but it is that lack of chaos in the morning that allows me to come into each day with a sense of clarity within my purpose. Additionally, I keep my ear close to my stomach when it comes to understanding what my body needs for sustenance. I take really good care of myself in that regard in how I choose to satisfy my hunger. Ever since Sip-N-Glo has become our neighbor at the Rittenhouse Square studio, they have quickly become my go-to coming and going to the studio. It happens often where I stop by on my way to class to grab a smoothie or juice there and the entire thing is gone by the time I have walked that ONE BLOCK between the store and the studio. Self control is a practice. SNG: What’s your favorite Sip-N-Glo drink and why? RL: Goji Glo (with added hemp protein). Peanut butter is my favorite ingredient in a smoothie, and the Goji Glo does it right with the added goji berries to transform a simple peanut butter and banana smoothie into this dream concoction that tastes like a PB&J sandwich. I add the hemp protein to it for added sustenance to help me during those longer pushes and runs in class ;). The holidays are creepin' up fast which is exciting, but can also be a bit anxiety inducing. Have no fear, we've got the cure. Back by popular demand, we're elated to bring you this season's Glo in the Dark guided meditation series. 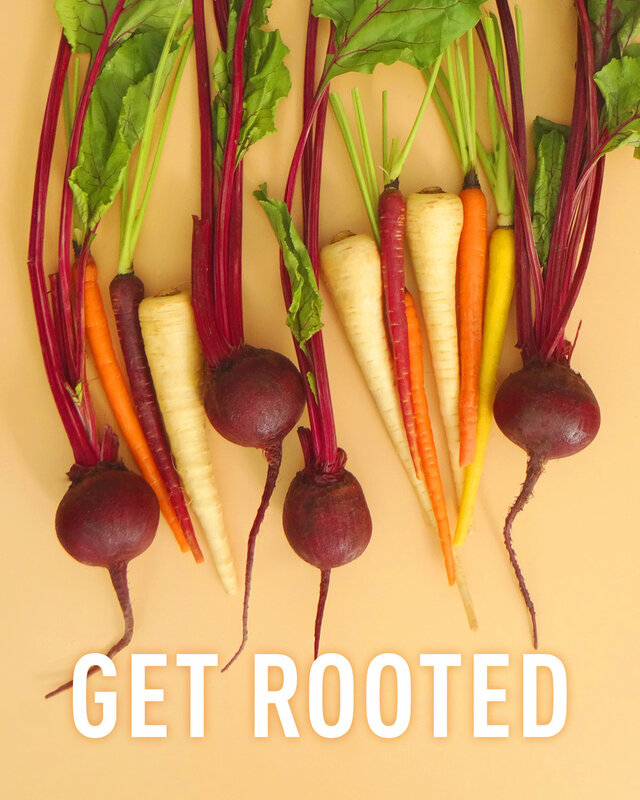 Join Sip-N-Glo Juicery and Philly Power Yoga and Thrive Pilates, Ali Tomlinson, for Glo in the Dark: Get Rooted. On Thursday, November 16th at 7:30pm, we will gather at Sip-N-Glo Juicery Rittenhouse for an evening of grounding, settling, and anchoring into our happy place as we prepare for the hectic holiday hustle. Ali will guide us into a deep state of relaxation as we enjoy a meditation practice that draws us deeper into a place of internal ease. We will sit, breathe and anchor. We will get deeply rooted in a state of gratitude for all that we have to give this holiday season. As always, after our practice we will bask in the Glo of connection and enjoy complimentary juice from Sip-N-Glo. Halloween Healthy Habits with SerenaFit! Maintaining healthy habits during Halloween can be challenging. Temptation is everywhere and it's easy to fall out of that routine for the chance at an evening on the couch with a bag of mini candy bars (guilty as charged). Have no fear, we've called in a member of our Sip Squad, Philadelphia-based health and wellness guru Serena Scanzillo, to give you her pro-tips on combating those temptations and maintaining healthy habits during Halloween! Check out Serena's healthy habit hacks in our interview below. Serena: I’m Serena and I founded and run SerenaFit! I’ve been in business for about ten years now and specialize in training on-the-go via virtual studio. I have a pretty vast athletic background having played and coached lacrosse, soccer + swimming, raced multiple half marathons, sprint triathlons + endurance runs and participated in many summers of youth coaching. My personal training skill set mainly focuses on core balance, strength + high intensity interval training to appeal to clients who don’t have a lot of time on their side. It’s important to train for function these days! I also have 5 years experience working in Baratrics at GW Hospital both in exercise + consulting. My entrepreneurial journey has been a huge adventure. I thrive off of knowing that I’m a woman in business and wake up every single day loving the hustle. I started my business in 2008 and quickly realized that I needed to be more than just a personal trainer to succeed. That’s where continuing education, the startup world, travel, design and business organization came on my radar. I got things together really quickly and started learning more and more every year. I’ve been recognized by British Airways, traveled to Italy + Spain to live in co-working spaces to connect with other founders from around the world, I’ve read month's worth of Entrepreneur Magazine :) and have attended countless mindset retreats, mentorship programs + design seminars. It’s all to improve, ya know? You have to want it. You can’t stay stagnant and you can’t settle. You have to be the best at what you do and that’s my ongoing mantra. SNG: Halloween can be challenging with all the temptations of candy (i.e how many mini Reeces Peanut Butter Cups can I fit into my jacket pocket) and sweets. What are some hacks we can use to avoid finding ourselves surrounded by empty candy wrappers? Serena: Haha! Yes, this comes up every year! Hack one: Never leave the house hungry. That’s a sure fire way to end up grabbing at junky snacks without much focus. Eat or make a shake before you head out. Hack two: If you have treats around, grab a few sandwich bags, place three pieces of small candy in each to track portions. Enjoy it with hot tea and while eat sitting down. Fully enjoy the treat and allow your mind to register the enjoyment. Don’t eat and talk or walk! Hack three: Just remember that sugar is at the core of all bad results. Sounds negative but it’s true. The more you keep sugar on your palate the more you’re going to crave it and by default, keep it in your diet. The less the better! Just keep the word “balance” floating around and you’ll be good to go. SNG: What are some of your favorite alternatives to candy or sweet? Serena: Besides all the juices at Sip-N-Glo? I would say my new favorite alternative would be a serving of really good Greek Yogurt topped with figs. It’s the perfect combination and bonus that figs have a ton of magnesium, calcium + potassium which is perfect for muscle recovery. My second go-to would be a cut up apple with cinnamon + a drizzle of honey or agave. It brings me back to childhood and has really good flavor! Serena: I’ve been getting better at my morning routine which includes setting positive intentions for the day. Instead of looking at my cell phone allowing emails and texts to run my first few moments of the day, I wash up while repeating positives like, “I’m grateful for another day filled with opportunity” or “All good things are coming my way” - things like that. Setting your mind right is like setting the perfect tablescape. You take the time to decorate it and make it look beautiful, then you have it to use, enjoy + generate positive vibes! Serena: I’m fully in love with the Blue Sky and Pineapple Charcoal Lemon-Aid. You can’t find these combinations anywhere else. They each offer a unique flavor and health boost. The Blue Sky snaps sugar cravings in half supplying a solid protein source and the lavender helps with digestion. Pineapple Charcoal Lemon-Aid is a free radial remover which is essential in maintaining hormone levels, good skin + energy. You can’t go wrong at Sip-N-Glo! These items are always free of charge! We teamed up with Grateful Plate this Thanksgiving to bring you an awesome healthy cocktail and side pairing! Tis the season to be grateful and GLO-ing! Place all vegetables into a large mixing bowl, mix with herb oil, balsamic and dried herbs. Toss to combine. Pour vegetables into a 9x13 inch ovenproof casserole and roast, uncovered, for 15 minutes. After 15 minutes, stir your vegetables and roast another 15 minutes or until vegetables are soft. Add all ingredients to a high power blender. Blend for 30=60 minutes or until all fresh herbs are mixed with the olive oil. Keeps in your refrigerator for 1 week. Our friends over at Grateful Plate sent us an AWESOME veggie burger recipe for your 4th of July. Don't feel like scarfing down burgers and hot dogs? Try this heathy and super delicious beet burger patty AND our Red White and Glo Juice Cocktail Recipe! 3) Garnish with some floating blueberries or slices of strawberries, and voilà! 1) In sauté pan over medium heat, add coconut oil to pan. Once the oil is hot, add the red onions and a pinch of sea salt. Sauté the onions until they get tender (about 5 minutes). 2) Add the garlic and shallots to the pan and sauté for another 3- 5 minutes. Take onion mixture off the heat and let cool. 3) In a small bowl, combine the umeboshi vinegar, Dijon mustard, smoked paprika, ground cumin, dried thyme, salt and pepper. 4) In a large mixing bowl, mix together grated beet, cooked short grain brown rice, great northern beans, rolled oats, parsley and onion mixture. 5) Mix in seasonings from the smaller bowl. With clean hands, mix and mash all the ingredients together. You want the mixture to be well combined. This will take about 3 minutes. 6) Taste burger mixture to see if it needs more salt. 7) Form burgers with a 1/2 cup measuring cup. Form burgers and let sit in the refrigerator for at least 30 minutes, at most overnight. 5 minutes per side or bake at 350F for 25 minutes. 9) Serve on your favorite whole-wheat roll with arugula, balsamic maple aioli, sautéed mushrooms & onions. If cheese is a must for you, spread soft goat cheese on the top roll. Our Vegan Kale “Caesar” Slaw provides uplifting energy and is very refreshing. Serve this slaw as a side salad, on top of your favorite veggie burger or as the bed for grilled chicken or fish for a delightful summer meal. Your guests will not believe that this slaw is vegan! 2) Make the Salad: Mix together the kale, radicchio and endive. 3) Dress the Salad: Toss the greens with the dressing and enjoy! Hope everyone has a happy and healthy 4th!